Prof. Laurence Maslon discusses his new book Broadway to Main Street: How Show Tunes Enchanted America, which tells the story of how the most beloved songs of the American Musical Theater made their way from the Theater District to living rooms across the country. LAURENCE MASLON is an Emmy Award nominee who hosts and produces the radio series, “Broadway to Main Street,” which has been broadcast every Sunday for the last seven years on the NPR affiliate station WPPB-FM. He is an arts professor at New York University’s Tisch School of the Arts, as well as associate chair of the Graduate Acting Program. He edited the two-volume set American Musicals (1927-1969) containing sixteen classic Broadway librettos, published by the Library of America in 2014 to national acclaim. He wrote the American Masters documentary Richard Rodgers: The Sweetest Sounds in 2001 and with producer/director Michael Kantor, he co-wrote the PBS series Make ‘Em Laugh (Emmy Award nomination) and two episodes of the Emmy Award-winning Broadway: The American Musical as well as its companion volume. He is the co-writer, with Kantor of the three-part PBS series Superheroes: A Never-Ending Battle, as well as the author of the companion volume to the series. 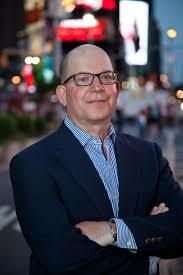 He served on the nominating committee for the Tony Awards from 2007 to 2010 and has written about musical theater and popular culture for The New York Times, The New Yorker, The Huffington Post, Slate, The Wall Street Journal, American Theatre and Opera News. His next book project is the companion volume to the Broadway phenomenon Come From Away. In February 2019, PBS will present an “American Masters” documentary he wrote and co-produced, Sammy Davis, Jr.: I’ve Gotta Be Me, which has already won a dozen awards from film festivals around the country. Oxford University Press has announced the release of Broadway to Main Street: How Show Tunes Enchanted America, the new book by Emmy-nominated producer, author and educator Laurence Maslon. The book features new interviews with theater luminaries Harold Prince, Sheldon Harnick, John Kander, Chita Rivera, and Steve Lawrence, in addition to prominent record producers and music critics to place the original cast album within the larger context of our national identity. The book, which includes companion website with audio examples, is perfect for everyone who wants to know more about how their favorite cast albums were created and received. The book Broadway to Main Street features new interviews with theater luminaries Harold Prince, Sheldon Harnick, John Kander, Chita Rivera, and Steve Lawrence, in addition to prominent record producers and music critics to place the original cast album within the larger context of our national identity. The book, which includes companion website with audio examples, is perfect for everyone who wants to know more about how their favorite cast albums were created and received. The crossroads where the music of Broadway meets popular culture is an expansive and pervasive juncture throughout most of the twentieth century—from sheet music to radio broadcasts to popular and original cast recordings—and continues to influence culture today through television, streaming, and the Internet. The original Broadway cast album — from the 78 rpm recording of Oklahoma! to the digital download of Hamilton — is one of the most successful, yet undervalued, genres in the history of popular recording. The challenge of capturing musical narrative with limited technology inspired the imagination of both the recording industry and millions of listeners: between 1949 and 1969, fifteen different original cast albums hit number one on the popular music charts, ultimately tallying more weeks at number one than all of the albums by Frank Sinatra, Elvis Presley, and The Beatles combined. The history of Broadway music is also the history of American popular music; the technological, commercial, and marketing forces of communications and media over the last century were inextricably bound up in the enterprise of bringing the musical gems of New York’s Theater District to living rooms along Main Streets across the nation. The story of this commercial and emotional phenomenon is told here in full — from the imprimatur of sheet music from Broadway in the early 20th century to the renaissance of Broadway music in the digital age, folding in the immense impact of show music on American culture and in the context of the recording industry, popular tastes, and our shared national identity. A book which connects cherished cultural artifacts to the emotional narratives at the core of American popular music, Broadway to Main Street: How Show Tunes Enchanted America is an ideal companion for all fans of American musical theater and popular music. OXFORD UNIVERSITY PRESS is the world’s largest university press with the widest global presence. They have an incredibly diverse publishing programme, which often surprises people who are expecting a traditional university press offering. Oxford publishes in many countries, in more than 40 languages, and in a variety of formats–print and digital. Their products cover an extremely broad academic and educational spectrum, and aim to make their content available to users in whichever format suits them best. They publish for all audiences, from pre-school to secondary level schoolchildren; students to academics; general readers to researchers; individuals to institutions. As a department of the University of Oxford. their worldwide publishing furthers the University’s objectives of excellence in scholarship, research, and education. Their main criteria when evaluating a new title for publication are its quality and whether it supports those aims of furthering education and disseminating knowledge.